We posted a while back on geometrics in decor. And much to our delight, geometric shapes are still on trend, and it's a trend that we adore! 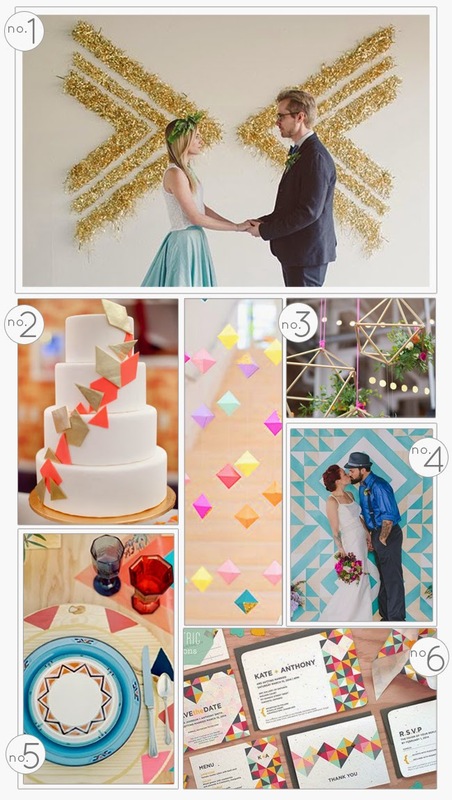 Whether it be triangles, polygons, diamonds or abstract shapes, they all bring a modern and fresh look to a wedding. We love what can be done using very simple angles and shapes, and this is definitely a trend for bold and modern brides to look out for. The fun thing about geometric details is that they can be used as simply or adventurously as possible, with a very neutral colour palette or a very bright and bold colour scheme. This trend is huge in urban weddings, and we see it coming forth in invitations, decor and jewellery. Have a look at this gorgeous Geometric styled shoot on 100 Layer Cake as well as our board below for more geometric inspiration!